Interference Acrylics — Interference colors "flip" between a bright opalescent and its complement, depending on the angle of the viewer. Relatively transparent, they allow artists the ability to glaze with unique effects. Add gels for impasto texture or thin with mediums. Try adding a very small amount of black to produce deeper, richer, opalescent effects. Iridescent Acrylics — Iridescent colors synthetically reproduce natural phenomena, such as the nacreous quality of fish scales and butterfly wings, or the pearlescent effects of certain metals and minerals. When mixed with traditional colors and mediums, they impart a luminous quality. "Coarse" colors employ a larger reflective particle size in comparison to "Fine" colors. 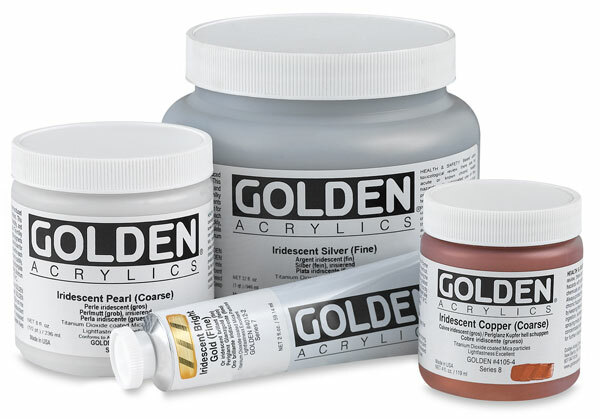 Special Iridescent Acrylics — Mica Flakes, Coarse Alumina, and Micaceous Iron Oxide: These special iridescent colors add a sparkly touch or a distinct texture! These extraordinary colors are created by mixing assorted mica partials with gel medium. The Micaceous Iron Oxide, with its rich simmer color and gritty surface, makes a glorious ground for pastels. Palette knife application is recommended.